From now on, you can view the Idle Heroes Tier List by MKxJUMP on this blog. This list shows you the best heroes in the meta right now. We will try to update the list weekly after the new balance update is released. Content created by MKxJump. Follow his Twitch Channel and Youtube Channel for more Idle Heroes content! Any hero not on this list is not worth the resources required for E3. Although one hero could be rated higher than the others, for some teams/situations, a lower rated hero can be better. Click on Hero name for more details about them. 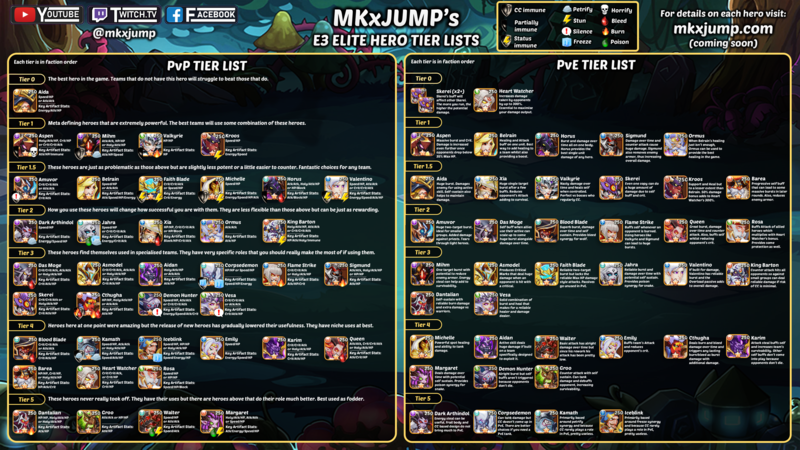 MKxJump’s Tier List 2019 With A Complete New Look! Reactive Heroes – Those with “on-hit” effects. Burst Heroes – Those heroes that can deal tremendous damage very quickly. Utility Heroes – Those that have, or are immune to, CC. Also, rather than suggesting artifacts, I outline the “Key Stats” of each hero that you should focus on when building your hero. There are so many different artifacts in the game now and accessibility varies from player to player. This approach should be useful for all and also help to assess the usefulness of future artifacts. Finally, this list should work for both PvP and PvE. Hero positions for PvE Boss fights varies dramatically from fight to fight so that cannot be included. Any anomalies like Heart Watcher and Sigmund, are addressed. These Heroes are best put in Slot 1 to trigger their reactive skills. For PVE, Sigmund and Skerei are the best reactive Heroes. These Heroes are generally best put in Slots 2 or 3 to keep them safe from Crowd Control. For PVE, Skerei, Barea and Horus are the best burst Heroes. For PVE, Heart Watcher is the best Support Hero. They have, or are immune to, Crowd Control (CC). Those with CC immunity are best used in Slots 4-6. Those that are not CC immune should be put in the slots that suit their other roles. Utility Heroes are generally not good for PVE alone. Added Valkyrie and Skerei to Tier 0. Changed some positions. Added Belrain to Tier 1. Moved Demon Hunter to Tier 1. Massive change. Focus on the best E3 heroes. Bloodblade, Queen, Aidan, Iceblink and Corspedemon all moved higher. Aidan buff increased viability of suicide teams (especially in Trial of the Champion) so Flamestrike moved higher. Faithblade moved down due to decreasing dominance in the E3 metagame. King Bartom moved up due to his buff to Tier 1. Xia moved up to Tier 1. Dantalian added to Tier 2 due to the new buff. It’s now very hard to kill him. Jahra added to Tier 2 due to the re-balance. Queen moved up to Tier 3 due to the buffs. Dark Arthindol moved down to Tier 3 from Tier 2. Corpsedemon moved up to Tier 3. Barea moved down to Tier 4 from Tier 3. Cthugha Added to Tier 4. Walter Added to Tier 4. Emily moved to Tier 5 from Tier 4. Belrain’s buff has transformed sustain strategies making her the perfect counter to many DOT users. She not only provides incredible buffs but keeps your important heroes alive and therefore has been moved up to Tier 0 status. Amuvor has moved up sits on the edge of Tier 0 due to his fantastic performance as a stand alone hero. His ability to shell out unprecedented burst damage when given the Punisher of Immortal makes him a great choice. I can see many offensive teams choosing him over Mihm to give their team a much harder punch. Horus has been added and as such PvE Tiers have been reworked to reflect just how powerful he is in that area. Horus finds himself on Tier 1 for PvP as well due to high and consistent damage with a decent amount of tankiness to boot. Skerei runs the risk of moving down but still dangles just on the lower edge of Tier 1. Flame Strike, Sigmund and Cthugha have all moved up to reflect the potential for burn teams in the meta which can help support the already dominating Valkyrie meta. Small adjustments to FS and the counter attack buff to Sigmund defintely make these two underused and undervalued heroes in PvP. Kamath moved up. I feel my previous list was too harsh to move him into Tier 4. He is losing ground but definitely has some usefulness in Rainbow or Ruin teams. Dantalion’s heal got nerfed. He’s much more susceptible to burst damage and provides much fewer Round 15 stalls. It can still be done, just not as much. Tier 4 seems suitable for a niche hero like this. These are over-powered Heroes, who swing the game in their favour. Those without will have a hard time winning. Role: Attack/Speed Buff for four allies and team healer. Mass heal on death. Very powerful Heroes who often make the difference between a win or loss due to their sheer damage or buffs. If built correctly, these Heroes will prove challenging even for the best of teams. Role: Mass counter burst damage, tank and CC + attack vs stunned. Role: Huge one-target burst, attack debuff and damage over time. Crit buff on successful block. Role: Huge Spread Burst Damage, Self-Buff, Sustain and Burst on Successful Block. Role: Self-buffing, attack steal and mass burst. Popular, strong and reliable Heroes. Each have a good balance of damage, control and support. Often find themselves in teams supporting higher tier Heroes and can often be challenging to face. Artifact: Speed or Energy (Attack). Strong Heroes if used correctly but can be sometimes overlooked because other similar Heroes are often better or they require specific slots and/or team synergies to perform their best. Some just lack versatility but are very good at what they can do. Role: Two-target Burst, Self-Buff and Self-Sustain. Role: Mass DOT, detonates and relies on Burn/Bleed effects (Burn/Bleed Immune). Role: Self-buff, + crit vs burned targets, spread burst with DOT. Good Heroes but only in specific teams or situations. They are often dwarfed by other Heroes in their faction or lack consistency/damage. Some are overlooked because they require specific slots to perform well or are countered easily by other Heroes. Role: Front-line burst with stockpiling crit/critdmg buff. Role: Split back-line stun, DOT and mass DOT when below 50% HP, +Attack vs Poisoned. Role: Self-buffing, tank with self-sustain, mass burn, + damage vs Warrior (often stalls to round 15). These Heroes are generally below average and usually not worth making E3. Some have situational strengths, others see more usefulness in PvE. Don’t be surprised if you fodder or replace these Heroes. Role: CC vs Priest, attack/crit debuff and self-buff. Vs Marauders/Broken Spaces, longevity is the key so Damage Over Time is more viable. Also, most are single targets so spread damage is less important. Vs Guild Bosses, Burst Damage is ideal because your team’s sustainability is limited. Often there are three targets so spread attacks are also favoured. Healing and Buffs/Debuffs are essential for both and tanks can provide further survivability. Stones should focus towards PvP but generally go for Attack/Attack or Crit/Crit/Attack in PvE depending on whichever maximises damage. Artifacts should match the enemy marauder/guild boss for damage dealers (E.g Attack/Damage vs Ranger for Kamath Marauder) or provide further survivability for support heroes. Due to the complexities of PvE, heroes are ranked based on their roles rather than just being in a static list list like the PvP tier list above.